I'll start with the vocal. If you remember, we recorded the vocal and the guitar at the same time. And it still sounded pretty OK.
You can close your eyes, we've made sure that no one will steal your wallet. So close your eyes and try and imagine what could be better. What could be better than Will Knox singing? Nothing. But the sound of Will Knox singing. What could we do better? Here's what I hear. S's being a genuine problem. Why is that? The reason why is because we made a compromise in the recording. We wanted to be able to catch all the emotion of will singing while he's playing the guitar. Consequently we had to put the microphone in a way where the guitar would not ruin the vocal sound too much and the vocal microphone would not ruin the guitar sound. Consequently we do not have the optimal vocal placement. But it's not as good as if we had Will this far away from the microphone in a perfectly well treated room. We're gonna have to deal with the S.
Then I hear a little build up in the middle. I hear a little bit of a mask in the middle of the vocal. I'm lacking a little bit of the air thing. And most importantly I hear a bit of a peak action going. You know? Here's really into it and he's pretty close to the microphone. The closer you are to the microphone the more dynamic problems you're gonna have. Because air, contrary to the popular belief, air is the insulation you can have. And air is a great compressor. And so, if you are this close from the microphone you get less of the compression action than if you are this far. Consequently we get a lot of peaks. I'm gonna play a track again and see if you can listen to the S, the mid-range, the lack of air. Ss, mid-range, lack of air and also that dynamic thing were on certain words the vocal sticks out. OK? Before I start fixing I'd like you to be able to try internalize the sound of the problem. Here we go. You hear the air. Obviously. If you don't that's OK. It's an acquired taste that comes over time. But I want to point out the dynamics to you. But listen to that dynamics. Listen to those two syllables. There's a frequency peak in the upper 3k. It hurts your eyes a little bit when you listen to it. Check it out. It's actually "ma". Do you hear the syllable on "ma"? That got awful. We're gonna fix that. It's not you honey, it's me. Today I wanna use nothing but Universal Audio plug-ins, with my trusty little satellite thing. The first thing we're gonna do is de-ess. Why do I de-ess first? I de-ess first because if you start screwing with the sound, specially if you are compressing and doing stuff like that, you're actually gonna make your problems worst. And magnify them. If you have a problem, like a genuine spotable problem, take care of it first, before you start compressing. So, let's go for that. I'm soloing the frequency at which I'm gonna de-ess. And then I'm gonna lower the threshold. And maybe slow it down. OK. So, we start with this. I went a little too far. Right? You hear it work. The problem is that it is a real problem with this recording. OK? That's the built-in UAD De-esser. I still have that "maaa" thing. There are several solutions to that. I could automate an EQ on that one word. I could put an EQ on and every time that frequency annoys me I could just go 'rriiii'. Right? But I'm way too lazy to do that. So no, I'm not gonna do that. The next thing I'd like to do is I'm probably gonna hi-pass this. energy of the guitar getting in the way. That's my problem, I use the wrong button all the time which is difficult in my line of work. I'm just gonna hi-pass the bottom. Hi-passing the bottom let's me cleaning up the mud at the beginning. Somebody asked Alan how to get a clear mix. Is that person here? Very good question, thank you for asking, I'm still looking for the answer. The reality is there is a mid-range build up. And now with digital there's a mid-range buildup and a upper mid-range buildup in the 3k area. The part that hurts your eyes and your teeth that's the 3k area. And then the bottom, the area at 300 has always been the problem. And so I hi-pass a lot. I do a lot of hi-passing. Provided that I don't have any phase problems. In this case considering that everything bleed into everything I have to be very careful. And use a very gentle curve. Let's see this. With no de-esser and no hi-pass. I'm gonna play that again and point something to you. "I'm solid steel", listen to the 'mmmm'. Hear that little 'mmm' round and resonance here? See if you can detect something in that family on the flat recording. Check it out. You hear his nose on 'ummm'? Yeah, you can hear that? I had to point it to you. Two mixes from now you're gonna point it out to yourself. Right? I have to show you this but once you start forming your taste by listening to enough music that will urke you. I get to get rid of that. It's something in the back in your spine that just goes like 'uuurr' So. This is hi-pass filter at 45hz 18 dB per octave. No, sorry, 66 and change. Which is completely irrelevant because I'm not even sure if this numbers are real but this is the way it is right now. OK, so check it out. This is... Flat. I spoke too much in between. This is flat. But it doesn't sound processed. I was like... "You really seen this?" "Yeah." This thing is awesome! It's called the FATSO. I've been using the hardware unit for the longest time. It's a compressor and a tape emulator, although I'm not quite sure it really sounds like tape to me. But it is so useful and so wonderful. And it has a circuit called 'Warmth'. Which has nothing to do with Warmth whatsoever. It's the biggest misnomer in the history of recording. It's actually a high frequency de-esser. It's a high frequency limiter. You can't put the 'Warmth' on if you have something high-end that annoys you. Something that just "eeeee" you put the 'Warmth' on, it gets rid of that. I'm gonna compress a little bit on the bus compressor, just because I can. I want put the transformer emulation. Because it does good things for transients. And then I'm gonna put the. 'Warmth' on to see if I can catch those annoying peaks. Let me gain stage it. This is all without have done that, of course. I'm being caught with my pants down. I'm gonna use it this way. Aha, it's coming. Check it out. You noticed that we have 2 or 3 dB of compression. Two or three dB of compression. That's it. There are so many plug-ins. I mean, I have a LA-2, I should have used it. It sounds fine, leave it alone. It looks pretty when it goes like this but that's not what we want. We want it to sound pretty. Different! At this point in the mix I'm like: 'OK, I'm very content with this'. I feel that the vocal is a little dark. So I'm gonna show you another concept of analog summing. Remember I told you we have a source, you have the Dangerous summing box and you have the recorder. I love to be able to insert say, and EQ in between the converter and the two bus. It's the same as having an EQ in-line in your console. Right? Except here you can choose everything. You just patch it in. So what I've done, is on channel 9 and 10 of my mix, I have inserted a Great River EQ. Ten is the vocal and nine is the bass if you were paying attention. I'm gonna start with the vocal. One of the great advantages of working with analog summing is that you have a lot more headroom, you don't clip as much. I'm sure you had this problem with your mix. At a crucial point, about four hours into the mix, that point when you start screwing up, Everything is red, you think it's Christmas in your studio. The idea is, what's going on? You're overwhelming the headroom of your mix. No big deal, you just take all your faders and bring them down 6 dB right? That's how it's done. Have you taken the time to listen, pre and post, that 6 dB move. 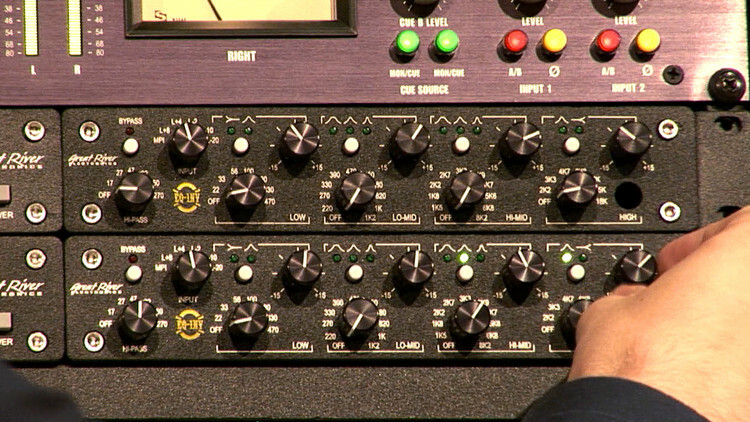 What it does to your reverb sends, what it does to your 2-bus compression, what it does to your stems. It's chaos! I choose to bypass that. And I use analog summing and I never have to do this. Because say I wanna add 6 dB to my bass drum at the end of the mix. I put it in between my converter and my 2-bus. I'm now no longer in the digital domain. I can crank the hell out of that, and there's no problem it just goes 'Boom, Boom, Boom'. Which is conducive to dancing. So what I'm gonna do right now is I'm gonna insert this bottom EQ on the vocal. And I wanna see if I can find a little bit of that shine that we're missing since the beginning. I'm just good loop this and show you stuff. The first thing I wanna do, because I can, I'm gonna use the high-pass again. Go look for some high-end, they have and 18k range up here. I'm gonna exaggerate so you can hear what I'm doing and then I'm gonna do reasonable, civilized amounts of correction. I'm on a peak thing here at 18k. I can guarantee you that very few people in this room hear 18k. "I want add some 18k, I love 18k, 18k is my oyster." But no really. I like the frequency but it brings the 'maaa' problem back. I'm gonna use just a little bit of it. Maybe I could remove more of the 'maa' thing since it's in the 3k range. How about this? That's genuinely annoying so I'm gonna take that out. Now that I removed my problem more I'm gonna be able to boost the high-end a little more without any adverse effect. Maybe I can even start a little lower. and I think it's gonna work in context. I'm gonna remove a little bit of that low-mid build-up. That's dear to our friend over there in the back. That. It sounds like he's got a head cold. He can't have a head cold, he left England to no longer be cold. He's head is clear. Let's remove this. That removes too much body, I need that body. That's nice! I'm gonna do the same thing. I'm gonna add a little bit of that fat at the bottom. And add that but still remove that head cold problem. Don't be fooled by levels, it's very difficult for me to match levels here. But if I remove the EQ. And the de-esser, it sounds like this. This is the original recording. And this is what we've done so far. A lot more together. Ready to be integrated in the mix. Not as buoyant. Right? It doesn't have the same vibrancy. But in this particular case, because of where we're going. I think this is necessary. To do this. I know from experience, if I don't do what I just did I'm gonna hate myself in the morning. Let's leave the vocal alone. Let's listen to the bass. I pay money at university to learn this. But its free here. Sometimes life is weird.